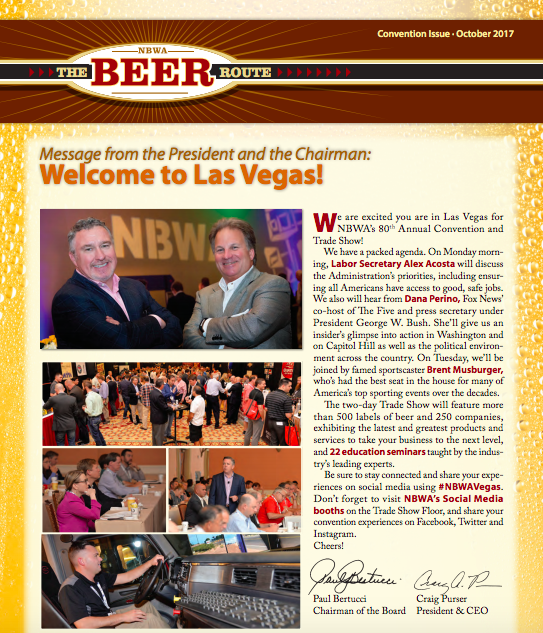 Read the 2017 Annual Convention Issue, which provides an update on the National Beer Wholesaler Association's recent activities and changes happening in the beer industry. Learn about ways to engage with NBWA on social media, ways to elevate standout employees at your companies and get updates on the Next Generation Group. As we look ahead to NBWA's 2018 Legislative Conference, find out about the value in bringing employees to Washington, D.C. for the first time. And if you missed the annual Beer Bloggers Conference or Center for Alcohol Policy's Conference, Beer Route has you covered with an update from both events.